Once, years ago, I noticed this beautiful head of hair in front of me in a public place. I thought it was a young woman with platinum blonde hair. Then she turned around and I saw that she was – though quite lovely – not a young woman, but probably in her late 60s. I realized her hair was gray, not blonde. Wow, so pretty, I thought – why would anyone ever dye that? 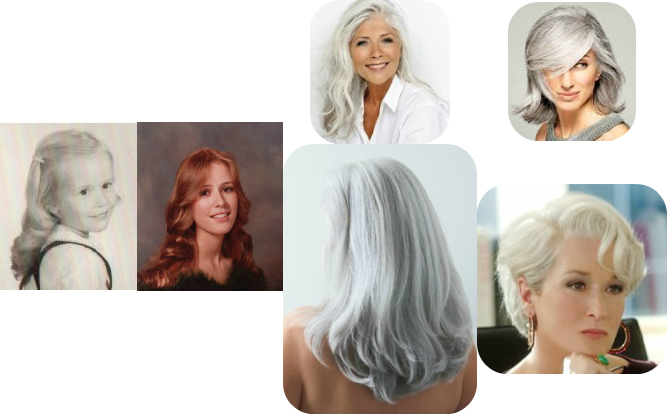 Over the years I’ve noticed other similarly lovely heads of completely, naturally, silver or white hair. As my hair started to get, as I call it, “sparkly” on top, I started admiring these beautiful natural gray heads even more. I began to wonder what a full gray head of hair will look like on me, and how my gray hair will be different from the way it is now other than color – maybe it will seem thicker like when I highlight it. How interesting it will be to watch my hair completely change color all by itself without having to pay for it. It will be sort of like when it changed from almost white blonde when I was little to strawberry blonde by high school (and then whatever color this is by this age.) I don’t remember ever having any worries about going gray anyway, but if I did, they dissipated as I looked at the pretty gray heads I saw here and there. 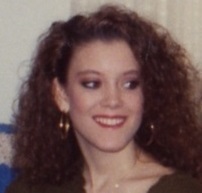 Eventually, I even began to look forward to going gray. And THEN, I became PROUD of myself for looking forward to it! As I shared this enlightenment and healthy attitude with my lovely hairdresser, Annmarie, she listened silently, examining my hair all the while I talked. When I finally shut up, she responded with, “Yeah, yours isn’t gonna do that.” Poooof. Sigh. Guess I’ll have to find something to like about getting wrinkly. We are all connected, joined together by invisible threads. When we hurt one other person, we hurt ourselves, hurt humanity. The poor and hungry are always with us; they would be donated to and thought about all year long. People living in institutions, like the Denton State Supported Living Center for instance, live there all year long and would probably enjoy little gifts and visits every month of the year just as much as they do in December; they would get that. People would buy gifts for loved ones occasionally just because they happen to see something they know that person needs, or would enjoy; gifts would have more meaning, and the stress of HAVING to find SOMETHING/ANYTHING at a certain time of the year would be eliminated. And they WOULD find things they wanted to buy because the people who design, create, and market all the things we like to consume would let some stuff out of the box all year long instead of withholding everything until the Consumer Frenzy Season. Stores would sell a little more all year long, instead of waiting until “Black Friday” (aptly named for reasons other than the one given, in my opinion) to turn profitable. We would be able to go to the store for routine purchases in December without having to fight massive crowds and crazy traffic. We would still get just as much time off from work and school, and we could still use that time to get together with our families, catch up on whatever, shop, go on vacations, etc. The pressure and expectation of having just the right family/life situation would no longer be concentrated and dumped all at once on people who do not have that, causing some to sink into depression – and some even to succumb to despair to the point of just deciding to end it all. People who want to enjoy fantasies as the source of good things with their children would still be free to do so if they wished – maybe Santa would come down the chimney on the first of each month in those houses with just one toy for each child, instead of once a year with a whole bag. And those who want to always tell their children the truth could do that too, still buy nice things for their children, and let the children say “Thank-you!” to the person who actually bought it or made it for them. As far as all those lights and decorations – well those are pretty any time of year. Maybe not snowmen in Arizona (ridiculous) or elves or reindeer, or anything else that makes no sense, but why not have buildings and trees lit up with pretty colored lights to enjoy every evening while we walk about in our less stressed and hurried shoes, buying something maybe or maybe not, and just enjoying the pretty sights? Most importantly, for those who really want to celebrate it once a year as Jesus’ birthday, maybe they could start celebrating that at a time of year that approximates the time of year Jesus was actually born on earth, instead of on a co-opted Pagan holiday that originally had nothing to do with him (in fact had some pretty horrifying, evil traditions.) The ideal of peace on earth, good will towards man could be shouted from the rooftops then, and I believe be more likely to be practiced every day of the year. They know things that you do not. Don’t judge how they see the world using a measure calibrated with how it looks through your eyes. Skidding . . . Spinning . . . Rolling . . . Screaming . . . Boom! Wish I would hurry up and get to the part where I’m surprisingly OK.
I’ve told a few people about the car wreck I had in 2004. It was awesome. Best car wreck ever. My Isuzu Rodeo skidded in the rain, spun 360 degrees, and then rolled over and over into a ditch. I landed passenger side down. The only broken glass was the rear window, giving me a place to climb out. I was driving alone, no kids in the car. Just before leaving on this trip, I had thoroughly cleaned out the car, so I didn’t have to worry about all my belongings being all over the place. The only things I had with me were my purse – ZIPPED closed (see characteristics of the perfect purse in another article) and the book I was reading at the time (I think it was Dorothy Parker.) I took these two items and climbed out the rear window, much to the wide-eyed astonishment of a man who had apparently seen the wreck and stopped to help. I think he expected to find someone dead or paralyzed – which is exactly what I was expecting while spinning and rolling. But I was not even bruised or scratched! I wasn’t even SORE the next day, or ever, from this wreck. The car was totaled, and we had Gap insurance, so this got me out from under a car I totally could not afford. I’ve made the joke a few times – I was “upside down” on my car loan, so I just turned the car upside down and that fixed it. My husband had recently bought a junky but good little used car that I could drive, so I didn’t even have to go car shopping. Everything about this was good for me! There is absolutely nothing about this incident I would have changed . . . The other good thing about that wreck is that it gives me a great metaphor for what I’m going through in my life now – wondering if I’m going to get a teaching job, and if I’ll really be able to handle it if I do get one. Even if I do get a job, even if it is the perfect job, and I am great at it, I already know that, best case scenario, it is going to be just-barely-actually-not-quite-but-I’ll-make-it-work on time before I am completely, seriously, not even kidding, BROKE. So, I sort of see this period as like when I was in the middle of the slow-motion wreck, before I found out how OK everything was going to be. I’m seriously scared, and part of my brain is definitely screaming, but I’m trying to also remember how that wreck turned out, and enjoy this ride, hoping that soon I’ll hear a big BAM, and start seeing how OK everything is going to be. Then if that happens, wouldn’t I feel silly for not enjoying and making the most of all of this free time? So far, since being unemployed this summer, I’ve gotten some big projects taken care of that really needed taking care of. I feel so much satisfaction from that and I’m looking forward to tackling a few more of those. I’ve spent more time with loved ones, and plan to fit in some more of that soon—haven’t gotten to everyone yet. I’ve been available to help someone who needed my help, but I usually wouldn’t have been able to give it. And today I’m off to spend some time with my nephew and I’m going to enjoy the stuffing out of it. I’ve been thinking since this morning about time. It started as I finished a hurried, distracted conversation with someone who has so much to tell me but not enough time to tell it because she has to get to work. And, so do I. Frustrating. I want to hear the story! I think about other times when I want to “spend time” with someone but it just doesn’t work out because one or the other of us “doesn’t have the time” after taking care of our responsibilities. I remember time from the past, periods of my life that I want to rewind to and play over and over again, or maybe freeze and just stay there. But I can’t. It’s in the past, and I can’t go back, but only forward. Because that’s the way time works. Wouldn’t it be great if there was no time? I don’t mean “no time” like we usually mean when we say that phrase, as in, “I have no time for myself,” or “I don’t have enough time to get everything done!” No. I mean—what if there was no such thing as time? What if time didn’t exist? That seems like a very pleasant existence to me as I think about it today. Maybe that’s part of what makes heaven—timelessness. A constraint lifted, eliminated, freedom. I’ve heard almost everyone I know, who knew my niece Kami, say something along those lines since she passed. I wouldn’t be surprised if it is the most common feeling expressed ever by loved ones when anyone dies, because even if you basically treated a person well, we are human; miscommunications happen, we get impatient with each other, snap when we should speak with love, get too busy with the urgent and neglect the important, fail to understand the burdens someone else is carrying and criticize when we should just love–even in the best of circumstances. It is always going to seem, with loss, like you could have done better. And if there was indeed any problem between you or mistreatment on your part, it will probably seem bigger/worse to you when the person is not here anymore–when you can only say “I’m sorry” and “I love you” to the air and hope she hears. The lesson is obvious and I hope we will all hold on to it the rest of our lives instead of letting the passage of time numb us to it. Since that day, I have spoken harshly to someone I love, and I regretted it and apologized much more quickly than I would have before. I don’t like regrets. I have enough of them already to last me the rest of my life – don’t need any more. If I have wronged you, I’m sorry. If you have wronged me, I forgive you.